On a Caribbean Sea beach, this all-inclusive Runaway Beach resort features water sports facilities, 2 outdoor pools and 3 restaurants. It is set on 12 acres of tropical gardens. Guests at Royal Decameron Club Caribbean Resort can enjoy the 2 tennis courts, beach volleyball court and fitness center. They can take scuba diving classes and go snorkeling or windsurfing. 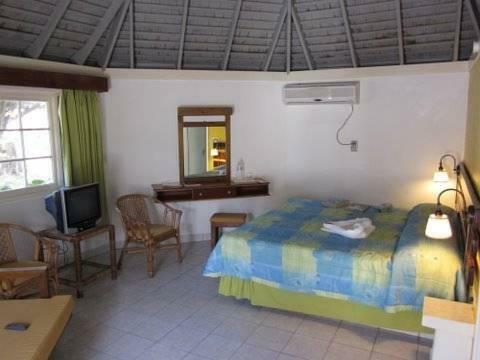 Each cottage and room at Decameron Club Royal Caribbean Resort has a view of the grounds and tile floors. A cable TV is also included. The restaurant 'Pick a Pepper' serves breakfast, lunch and dinner buffets, and the restaurants 'Nyaming' and 'Jazmine Delta' have options from the menus. Pool and beach bars are on site. Dolphin Cove and Dunns River Falls are a 20-minute drive from this resort. Please note that children are not included in the total amount of this reservation. You will have to pay the children rate upon check-in on your arrival day. Price depends on the season. You must show a valid photo ID and credit card upon check-in. Please note that all special requests cannot be guaranteed and are subject to availability upon check-in. Additional charges may apply.